Dusting. Dust cabinets frequently with a soft lint-free cloth. You can dampen the cloth slightly with water or a spray-type dust remover. Spills. Clean spills immediately. Use a clean cloth and mild soap if necessary. Wipe dry with a clean soft cloth. Cleaning. There are a number of products available for your wood cleaning needs. Use a clean cloth and mild soap if necessary. Wipe dry with a clean soft cloth. Polishing. We recommend that you wash and polish cabinets once or twice each year. Use a light coat of quality furniture polish. Don’ts. Never use detergents, soap pads, or steel wool on your cabinetry. These harsh abrasives will mar the wood finish. Additionally, we recommend that you avoid the use of paste wax and polishes that contain silicone; the wax build up is difficult to remove and will leave a residue that attracts dust. Periodically clean the interior and exterior surfaces of the door using a damp, soft cloth. Wipe dry with a clean soft cloth if necessary. Over time, Ultra Violet light rays in natural sunlight may effect the appearance of your cabinets. 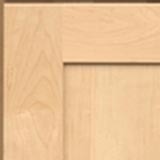 Merillat applies UV inhibitors to all its wood cabinetry as part of the finishing process. The finish on your cabinetry will not change, but the wood may, depending on its natural characteristics, the amount and direction of light exposure, and the portion of the cabinet that receives light.